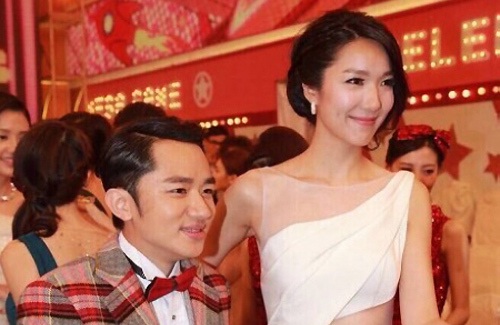 Wong Cho Lam and Leanne Li to Hold Disneyland Wedding on Valentine’s Day? Wong Cho Lam‘s (王祖藍) marriage proposal to Leanne Li (李亞男) was the most memorable moment at last night’s 48th TVB Anniversary Gala. Conceiving the idea with Eric Tsang (曾志偉), Cho Lam’s elaborate proposal touched many viewers as well as Leanne’s close friends. Eric revealed that the couple may get married on Valentine’s Day. Cho Lam and Leanne will reportedly hold a 100-table banquet at Hong Kong Disneyland, where they went on their first date. Cho Lam and Leanne both love Disney characters, and Cho Lam celebrated his birthday last year at Disneyland and filmed scenes for Come On, Cousin <老表，你好hea!> at the theme park as well. Asked to confirm his wedding plans, Cho Lam promised, “I will announce the details in a few days!” Currently in Mainland China filming Running Man <奔跑吧, 兄弟>, Cho Lam will return to Hong Kong next week to celebrate Leanne’s birthday. Besides Leanne’s excitement as a bride-to-be, her close friends cried upon seeing Leanne and Cho Lam find happiness together. Linda Chung (鍾嘉欣), Christine Kuo (苟芸慧), Eliza Sam (岑麗香), and Grace Wong (王君馨) were notified of Cho Lam’s proposal plans at hours before the TVB Anniversary Gala started. Although the women were bursting with excitement, they managed to keep the plans a secret to ensure Leanne would be surprised. 33 comments to Wong Cho Lam and Leanne Li to Hold Disneyland Wedding on Valentine’s Day? Interesting. I wonder who the other bridesmaids will be? Maid of honor has to be Leanne’s younger sister, right? Who’s going to be the best man and groomsmen? Linda Chung and Grace Wong will likely be part of the bridesmaids, as they are very close with Leanne. Thanks for the info Jayne! That is great to hear. I don’t know. Something about this couple seems fake and pretentious… Wish them the best though. The greatest mismatch in HK entertainment history! When the shorty’s popularity goes downhill, the tall girl will leave him for sure. Just wait. another Carol cheng and lui fong? actually he’s not bad looking with photos taken at an angle, like the one above. @SouLuckee – what headlights? looks flat as runway 1 at Chep Lap Kok. i wonder if fala would be invited since they were in the pageant together. With all their connections, probably not a good idea to invite since Fala Chen may take every opportunity to steal the limelight and/or dig for gold. snow white marrying one of the dwarfs. i hope it won’t be a disneyland wedding. they are 30, not 21.
it’s ok…after all a 21 year old can still have a princess theme birthday party. Disneyland wedding is ok. I guess their ride will be through the “It’s a small, small world” or will be the Carousel? HK Disneyland is so small. I know Leanne is tall but here she looks like she’s absolutely towering over Cho Lam. Gosh, really don’t want to say this, but they really look like mother and son in that pic. Just reminds me of those socialites bringing their fancied up sons to important functions. WCL wearing bow tie & plaid suit looks like a little boy. Making fun of his height… Y’all very classy. Bunch of shallow jerks. You guys are a bunch of shallow jerks. You’re all hating because they’re getting happily married, and there’s nothing going on in your life. There, I’ve said it. man, you guys are hella critical of them. the more important thing is that they’re compatible in terms of where they want their relationship to go and their personalities. is anyone going to throw up or get seriously ill seeing a tall girl with a boy shorter than her?? Disneyland is supposed to be a happy place for the young and the young at heart. holding a wedding there is memorable. I really do think this is out of love and not Leanne marrying him because he has money now. I mean, Leanne does exude a type of innocence and i’m not just saying it cuz she is a Christian. Not like… whatever her name is Grace Wong? Dude, she preaches Christianity but does all those sexpot roles at TVB. UGH. Congrats ” good flower planted on cow dung” kidding!! Mother bring son to play wedding game. Best place of course Disneyland! So mother bring son play wedding game, then who is playing the bride. OK, Jr, behave yourself and Momma will give you a lollipop later!